Hello friends, do you know about Nokia oro ? I want to share information about Nokia oro. 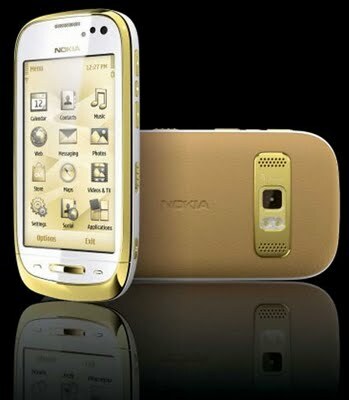 Nokia oro is a luxury nokia coated with 18 carat gold, leather and sapphire crystal. Nokia Oro have features like 3.5-inch AMOLED screen with ClearBack technology, 8 megapixel camera with 720p HD video recording capabilities, Wi-Fi, Bluetooth, and support for 3G networks with HSDPA. One that I like from Nokia oro is his gold layer. What about you, what do you like from Nokia oro? Nokia Oro uses the latest Symbian operating system Anna.